I have been green with envy when I look at dudes with ripped abs or when I have had one too many while celebrating St. Patrick’s Day. As Kermit the Frog says, “It’s not easy being green … but green’s the color of spring.” So in many ways being green is awesome! This month it is time for us to celebrate the green in our life. When the leaves on my beautiful 100-foot tulip tree in my backyard start to bud, I know that spring is on its way and green is coming. Eating green can help your health in so many ways as explained by the vivacious Kathy Kingen in her blog, Go Green, Sustain Yourself. My favorite vegetables in the entire world are green. I love fava beans, English peas and artichokes. 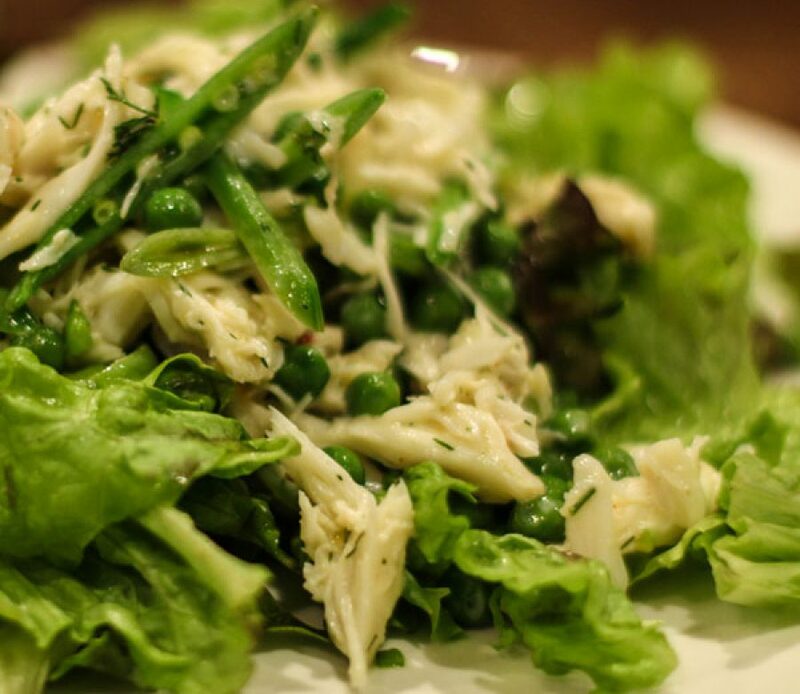 This month I want to give you one of my favorite pea and Dungeness crab salad recipes. The sweetness of the Dungeness crab balances nicely with earthy sweet peas, and then we add a little citrus to push this dish to greatness. Pick fresh Dungeness crab meat and refrigerate until nice and cold. Bring 2 quarts of water with 1/2 tablespoon of salt to a boil. In a separate bowl add 1qt of water and 1 ice cube tray of ice cubes. Place the English peas in the boiling water and cook for 4 minutes. After 4 minutes add sugar snap peas and cook for 1 minute. Remove both English peas and snap peas and drain and then place in the ice water to immediately STOP the cooking process right away. Once fully cooled drain again and then set on a clean kitchen towel to let them dry (excess water on the vegetables will water down your salad). In a large bowl add the peas, sour cream, olive oil, dill, orange juice, lemon juice, salt, black pepper, fennel seed and cayenne pepper and mix well. Add the crab and fold gently so you do not break up all the crab. Serve over greens to make an awesome salad for dinner or serve with crostini. Garnish with lemon zest.